Over 300 million users watching video smoothly! SPEEDbit Video Accelerator for Mac. Just install SPEEDbit Video Accelerator and it works automatically with YouTube and other leading video sites to provide the best possible web video experience. Download music and movies from iTunes super fast. Stop waiting for your purchases and start enjoying them. 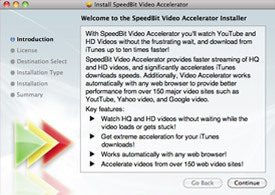 Download SPEEDbit Video Accelerator for Mac, and then run the installer application. After the application is installed, open the Video Accelerator preferences pane in System Preferences, and then click the Register button to enter your registration code. Type your email address and the activation code you received into the appropriate fields, and then click Submit. You can copy and paste the code from the email that was sent to you. SPEEDbit Video Accelerator uses its own proprietary and award winning technology and algorithms that download and stream videos at the highest possible speed. SPEEDbit was awarded the 2008 Technology Pioneer Award by the World Economic Forum for the innovations that power SPEEDbit Video Accelerator. SPEEDbit Video Accelerator eliminated 25 buffering stops from an HD video. "Life-changing technology innovation and potential for long-term impact on business and society..."
[The] new accelerator can download a film inside 20 minutes...this could revolutionize the online video industry. Singapore Gov. tests found that DAP increased High Speed internet download speed by up to four times. This funny video by NRK is debating the most important technology issue in video on the web: Buffering. Copyright © 1999-2019 SPEEDbit Ltd. All specifications are subject to change.